It took him seven years to reach the milestone. As Fortnite has taken over the zeitgeist, its high tide gave rise to someone else: Tyler "Ninja" Blevins. 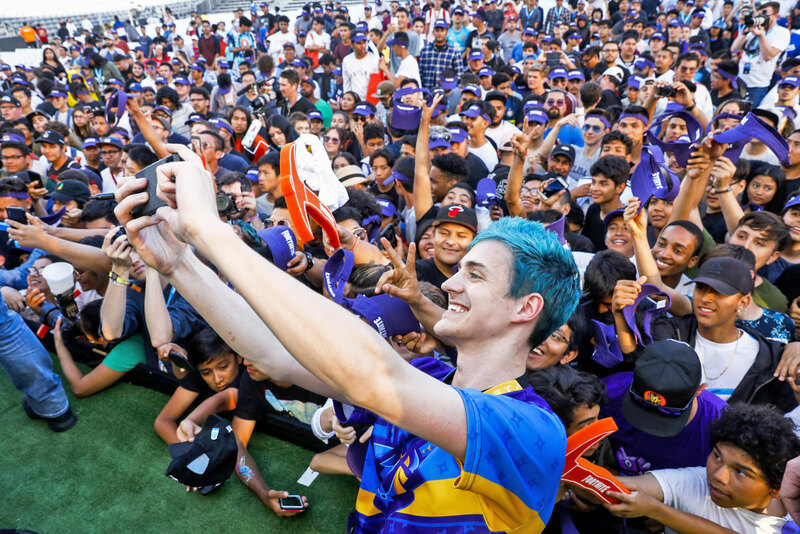 The streamer has more or less become the unofficial face for the game, appearing in tournaments, racking up sponsorship deals, playing Epic Games' free-to-play cultural phenomenon alongside celebrities. He makes $500,000 a month from streaming. Blevins also crossed a major threshold: He's the first to tally 10 million followers on Twitch, as spotted by Dexerto. This didn't happen overnight, though. Blevins has been streaming on Twitch since 2011, when the service was called Justin.tv and he was just 20 years old. Two years prior he was a professional Halo 3 player for high-profile esports teams including Cloud9 and Team Liquid. He moved between teams and games in the ensuing years, swapping to H1Z1, back to Halo briefly and then settling on PlayerUnknown's Battlegrounds for a bit. Last September he started streaming Fortnite: Battle Royale. At the time, he had a (comparatively) paltry 500,000 followers on Twitch. This March, he set a record for most concurrent viewers on the platform after 628,000 people tuned in simultaneously to watch him play Epic's game with hip-hop superstars Drake and Travis Scott, and later, Kim Dotcom. The reason Ninja is popular isn't because of his cyan-hued coiffe, it's because he's engaging to watch and generally pretty damned good at Fortnite. At the first-ever Fortnite Pro-Am this June, Blevins partnered with EDM producer Marshmello and took home $1 million for charity. He faltered by dropping a racial slur while rapping along to music during one stream in March. Blevins immediately apologized, saying that it was his fault and his responsibility to make his broadcasts more inclusive. Since then, he's stopped swearing in his streams and fake freaking out when something happens in-game. As his influence has grown (he has 16 million subscribers on YouTube; PewDiePie has almost 65 million), his on-stream persona has matured. He has the attention of millions of impressionable minds, and as such has cleaned his act up a bit. However, in April, the 27 year-old said he wouldn't play with female streamers out of fear that it'd give rise to rumors the newlywed was cheating on his manager and wife, esports personality and former Halo streamer Jessica "JGhosty" Goch. "It's something I'm not super into doing," he said. Blevins repeated the sentiment as recently as a week ago. Just as there's a presumably wide berth between PUBG and Fortnite's player counts, there's a six-million follower gap between Blevins and the number-two Twitch streamer, Michael "shroud" Grzesiek. Of course, success breeds imitators. When Microsoft revealed its Summer of PUBG campaign, the promo video featured a blue-haired broadcaster of its own. Blevins' hair is currently magenta.